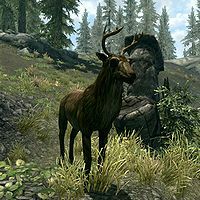 Deer are passive creatures found throughout Skyrim. Quite shy by nature, they will flee when approached or threatened. They can be hunted for their venison, hide, and large or small antlers. 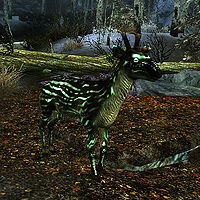 There are two different species of deer in Skyrim, though the differences between the two are largely aesthetic. "Deer" resemble caribou or reindeer. "Elk" resemble the extinct Megaloceros. Occasionally, either species can be heard bugling for mates. When hunting a deer, it is advisable to try to kill them in one hit, as they have a very high movement speed and a tendency to change direction when fleeing; alternatively you could add a poison with a slow effect, to allow for an easier second or third shot. You may also cast a Fury spell on them to prevent them from fleeing. Sneaking can be problematic, since the detection eye will not open regardless of whether or not a deer detects you. Smiths should note that unlike deer hides, the deer pelts occasionally found in hunter's camps cannot be tanned into leather. 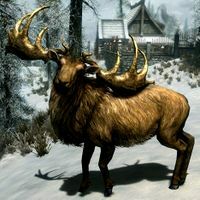 In the quest Ill Met By Moonlight, you are tasked with hunting the unique white stag. It is considerably larger than a standard deer, and its fur is much lighter in color. Elk incorrectly use footstep impact sounds from horses. This page was last modified on 20 January 2019, at 19:50.